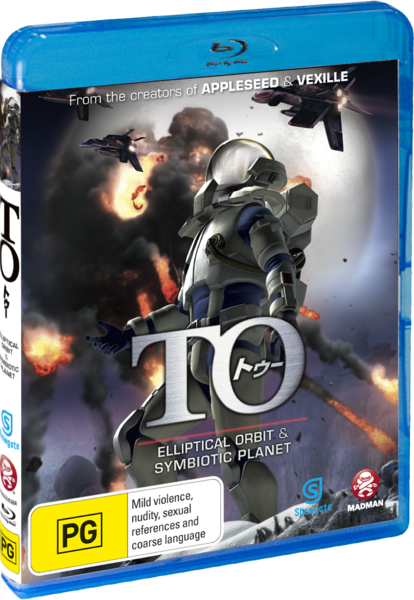 TO - Elliptical Orbit & Symbiotic Planet Blu-ray Review. ‘To’ is an anime with a little Arthur C Clarke running through its veins. To (that’s pronounced to, as in ‘fly me to the moon’) is a two-part OVA from director Fumihiko Sori. Fans of Appleseed, one of Sori’s past projects, will instantly recognise the visual style here: it’s all about sleek CGI animation, with nary a hand-drawn character in sight. The environments and characters are rendered in 3D and given a cel-shaded look. The inspiration for this film is ‘2001 nights,’ a manga created by Yukinobu Hoshino back in the 80’s. The two stories here, ‘elliptical orbit’ and ‘symbiotic planet’ come from a whole volume of works known for their hard SF approach. Elliptical orbit takes place onboard a massive earth-orbiting station, essentially a giant gun, whose task it is to fire containers loaded with supplies to the burgeoning moon base. The hard nut commander of this station is about to have his life turned upside down: first a mysterious woman from his past re-appears, and then his leadership and resolve are put to the test as terrorists sneak aboard and threaten the lives of his crew. Out of the two stories, this one is the more visually interesting; it’s set in space rather than on some obscure rocky planet like the second film. There are lots of laser fire-fights and exterior scenes, and generally more happening on the screen. As a way to introduce us to the world of ‘To,’ it likes to show off, with plenty of long, orbiting shots as spaceships meet and dock together. During these moments you sense that it’s tipping its hat to the biggest sci-fi epic of them all; 2001 a space odyssey. Symbiotic planet plays out like a futuristic re-telling of Romeo and Juliet. Our protagonists Ion and Alena belong to two rival factions, who share an awkward relationship as the twin custodians of a newly settled planet. As tensions rise and eventually boil over into armed conflict, Ion is infected with a strange fungal spore and sealed away. Throughout all of this Ion and Alena turn to science, nature and each other to try to avert an almost certain calamity. While still entertaining, the lacklustre scenery and slow pace make Symbiotic planet the weaker of the two features. It doesn’t make the most of the impressive cel-shaded graphics- a bland grey corridor is still a bland grey corridor, whether it’s hand-drawn or rendered on a computer. In the main special feature, director Fumihiko Sori speaks about the inspiration for this project, as well as the difficulties in producing a major science fiction film in Japan. There are also teasers for both films, TV spots and trailers for upcoming releases. If you choose either Japanese or English audio, you’ll get a version which has been tailored so that the characters’ mouths move in sync with the selected language. While the Japanese version is faultless, the English doesn’t quite sync up in places- it’s not terrible, but it is slightly off-putting. ‘To’ is an anime with a little Arthur C Clarke running through its veins. While the slow pace and distant characters may turn a few people off, there are plenty of good ideas here. Let’s hope Sori can overcome some of those cultural obstacles and make a live-action sci-fi epic one day!